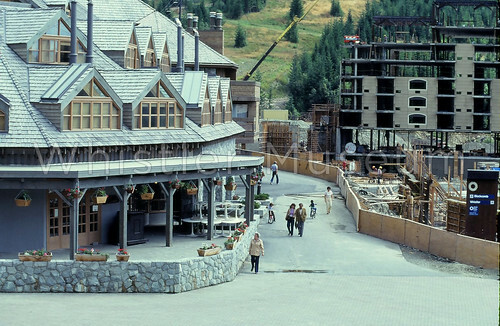 Building on the post from two week’s ago which examined some of the key influences that informed landscape architect Eldon Beck’s design for Whistler Village, now we will delve deeper into some of the challenges and happy surprises that came to light during the actual construction of the village. As Beck recalls, though he had a lot of support and leeway in crafting an initial design true to his personal vision, getting it built was a different story. 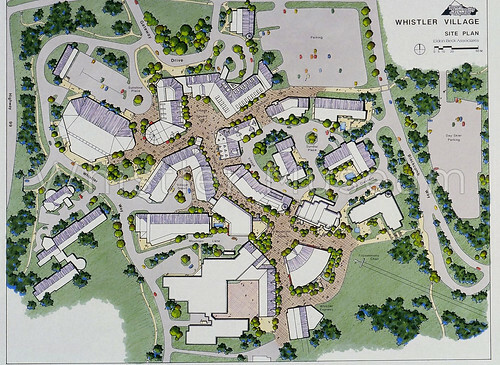 Probably the biggest [challenge] was that the various designers with their projects, the architects, were used to doing stand-alone buildings… The requirement that they subordinate their individuality to the totality of the Village was really hard for many to comprehend. We’d set it up, and that’s why we required models. We wanted to see how the models would fit together. We’d get one model, stick it by another, you’d see it didn’t match. We’d talk with them and say, “Can’t you make your roof form fit, can’t you make this happen?” We lost all of those battles. My first reaction when they were built was to walk around I got probably 40 or 50 slides of mistakes. So I took pictures of all these things that didn’t quite fit. A couple of years later I did the same thing and said, “Well those are really pretty nice.” It was almost the mistakes of not fitting that became human. It was more real and more human because of the imperfections rather than controlled perfection. It was interesting. I had to flip my mind around and say, “Oh, that’s kind of neat.” That really looks like [several] people did it instead of being totally controlled. But that was the big one. Their understanding that they were subordinate to the Village totality was hard for most designers to comprehend. And so in his typically philosophical manner, Beck learned that relinquishing some control could actually enhance his vision. I have not been consulted on any of those. I’ve been consulted on most new things in the Village, revisions within the Village… The problem with the big buildings, when they become vertical, they lose the relationship with the pedestrian level. It is interesting ‘cause it was almost the opposite to the question on over-planning… The controls were eased thinking that by golly if someone can come in and build something, go right ahead. Don’t worry so much about the regulations. So as dearly as I love Al [Raine] and Nancy [Greene], I think that the roof form on their building [Nancy Greene Lodge] was absolutely wrong. And I think it was at that point the Carleton Lodge was built. And I think that violated one of the early premises that that was the town living room. In early plans it was a two-story building, low in profile, so that when you came up the street you could see the mountains. Instead it became a big old block at the end of the street. So the whole west side of Village Stroll I thought was pretty badly compromised by that period of time. Probably the thing that’s most consistent actually is the spatial framework, the pedestrian framework of the Village has really survived. It was organized around views, so as walk at the end of the place, you see a mountain. So the structure of the Village really grew out of that view. That has remained and I think that’s been the thing that’s made it really work very well. I think Village Square is superb. The scale is right, the life is right, it really works. From there going back, Skier’s Approach to Village Commons, I think that’s probably one of the nicest sections in terms of scale… So I keep pointing back to that one section, saying that’s really what the objective was. I think Village Square is a magical place, it really works well. 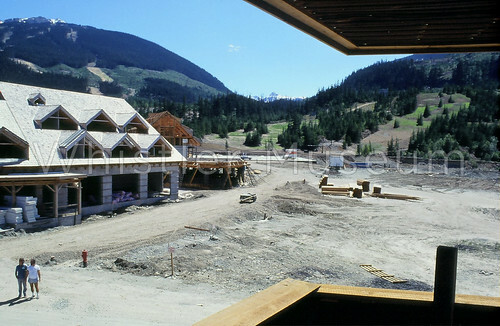 This entry was posted in Beyond Skiing, Ski-Town stories and tagged Eldon Beck, Village construction, Village Square, Whistler Village. Bookmark the permalink.